Content is the lifeblood of your adventure travel company. It’s what drives your inbound and outbound marketing efforts, cutting through the noise to speak with your unique voice. You have a rare, experience-based service. People need to connect to it before they’re willing to raise their hand and become a lead, let alone before they book. A well-constructed content strategy will drive every aspect of your customer lifecycle, building trust to convert leads and transforming current customers into recurring brand champions. Purpose: If you haven’t already done many profiles or interviews with your guides, this is where you need to start. Adventure travel is a personal industry. Your guides on the ground will have the biggest impact on the guest experience, and can spark the most important memories — whether it’s something as simple as encouraging a guest to reach a new height on a high ropes course, or as intimate as introducing guests to a favorite local restaurant and owner on a tour. Leads will feel a stronger attachment to your company during their consideration phase, as you’ve already begun to personalize the experience. Upcoming guests will feel peace of mind before the adventure even begins, and can push themselves earlier to more thoroughly enjoy the experience. Ease of Creation: This is the easiest type of content to produce! All you need to do is get a guide on the phone and send them some questions to answer. You should get responses on their experience, favorite aspects of your adventures, a memorable adventure moment, and whatever else you think makes your guides unique. Utilization: Host this content on your blog or a guide page on your website. This can be something for site traffic to naturally uncover during their consideration. Then, promote the content through social media and use the guide’s existing social following to expand the reach. Additionally, if you have a defined email list for upcoming guests, link and send the content in an email before they arrive. Example: OARS is a great example of a company that has mastered guide profile content. 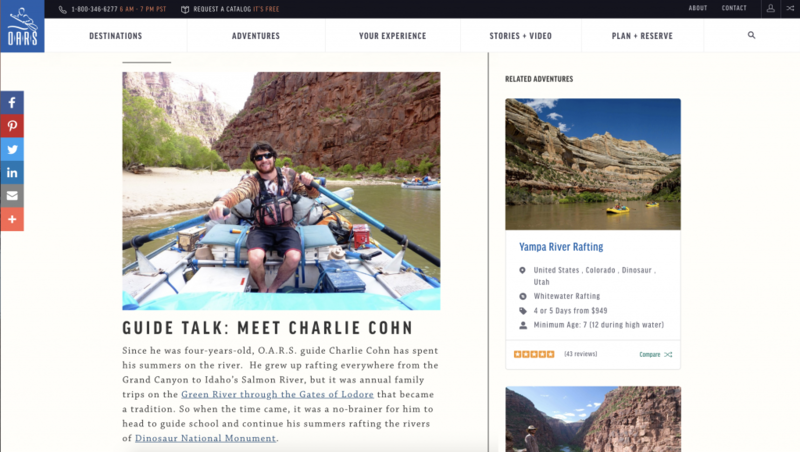 In this content feature, OARS has produced a simple interview-style piece that gives a personal introduction to a guide, Charlie Cohn, and why he loves his job. Then, OARS takes it a step further by tying the profile to related trips. Purpose: You already know the power of testimonials and reviews. Guest-generated content is one of the greatest tools you have to nurture other leads — and guest stories are reviews put in overdrive. By letting a guest describe their experience, you’re taking your brand messaging and focusing it through a relatable medium. You can still give the guest some initial direction and edit the raw content after they provide it, as long as their voice and message stay intact and you have their full approval of the final version. Leads will understand and connect to these stories. No matter how good your regular content is, this connection is unique — you can’t synthesize it. Ease of Creation: Easy! This content already exists, you just need to mine it from the memories of your guests. You can always find someone excited about their experience and willing to share it with others. To start an engagement with a guest, you can craft an automated email communication to send to customers after they return home (in conjunction with asking for a review). Or, you can personally follow up with guests who have already left positive reviews. If you want, you can even offer an incentive like a discount on a future trip! Utilization: Similar to guide profiles and interviews, this is content that you should highlight on your blog. Then, share it on social where you can leverage the guest’s existing community. This way, your featured guest will have become a brand champion. They’ll return for future adventures, and you’ve made an impression on everyone in their network. Example: A large part of Water By Nature’s brand are the personal connections that people can make on a multi-day rafting trip. In this guest story from Stephanie Pariot, the guest describes her journey from the moment she met her fellow travelers. You can feel the amazing relationships that she developed, capturing this brand differentiator — better than any marketer could explain. Purpose: Checklists and how-tos are easy content pieces that showcase your expertise and provide instant value. They should be something that a lead will already be searching for, so you can capture that interest and tie it to your company. Gear guides, training tips, ideas on activities in your area — the content doesn’t need to be complex, it just needs to actually be useful and solve a problem a lead is currently having. Inject a bit of personality and energy into it, and they’ll be interested enough to continue looking around your website. If you gate the content behind a sign-up form, it’s an even more direct lead generation tool. Ease of Creation: Easy-to-Medium. The core content should be easy to create, as you and your team should already know most of it off the top of your head. You might even already have something you can repurpose. If you want to make it a downloadable piece only accessible after leads submit their contact information, then you should take a bit more time to lay it out. Make it worth their investment — add a bit of meat to each section and pair everything with real photography that your company has taken. Utilization: Host these on your blog as a magnet for organic traffic. They’ll naturally be shared on social, but you should boost this effort by sharing them several times over a few weeks. If you have an automated lead nurture email campaign in place for new leads, add an email with this content early on — it will help assert your brand as an expert and get leads used to engaging. If you make it a downloadable guide, then put conversion points on your website and create a landing page with a download form that you can drive traffic to through online advertising. Example: Micato Safaris is a first-class example of how a company should provide expertise and value. 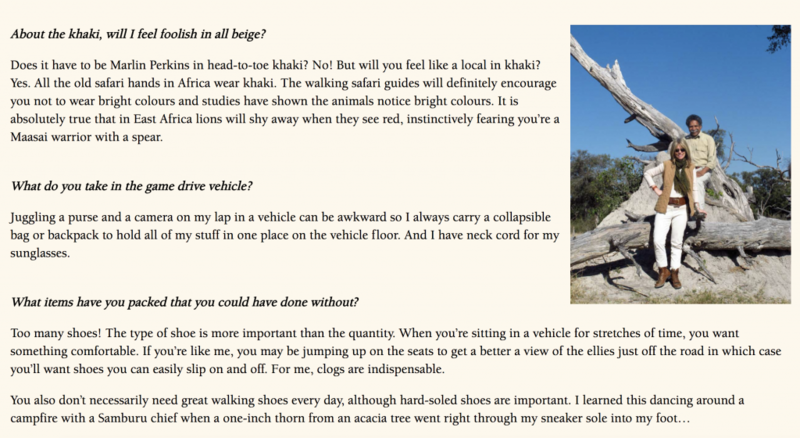 In this packing tips guide, they’ve injected their personality by making it an interview-style piece with Micato founder Joy Phelan-Pinto. Purpose: Before a guest actually goes on your adventure, it’s hard to fully convey what the experience will be like. 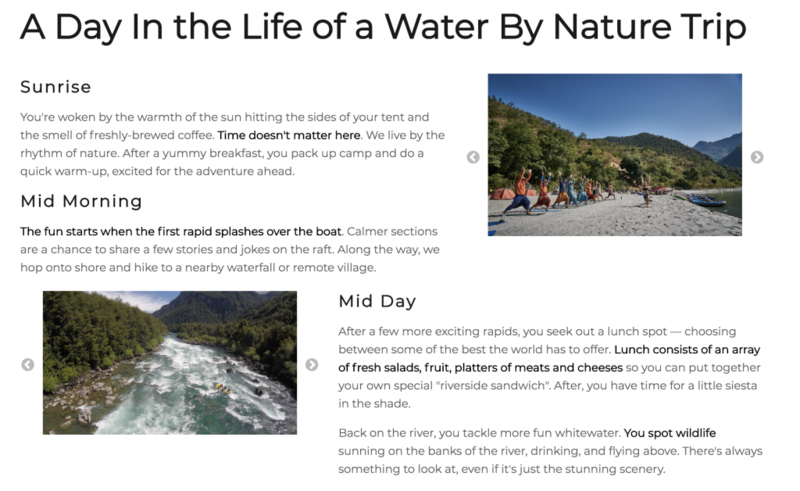 With this content piece, you’re helping them understand what a typical day will feel like — either by describing activities in broad strokes or by using one specific itinerary as a sample. This is another way to personalize your offering before you ever meet a guest in person. By relying on descriptive language and real photography, you’ll inspire adventure and make your brand stand out. Ease of Creation: Easy. You’ve already experienced all of this — just get it down in words. You can even work off of an existing itinerary if you want to highlight one in particular. Utilization: This will mainly be a content piece for your website, but that doesn’t mean you can’t promote it through your social channels as well. If you pulled a day from a specific or adventure trip, call out the guides who run it and take advantage of their social networks. Example: This is another content area that Water By Nature has taken advantage of. Because there are so many unique trips and experiences they offer around the world, they broke a day into several parts and described a general experience for each one. Combined with real photography from trips, it’s a great way of introducing what a typical day on a rafting tour would be like. Purpose: Your business will always be based on experiences. The better you can convey that experience, the more leads you’ll see reaching out to learn more or directly booking online. Videos capture interest because they can convey meaning and emotion from just a few seconds of engagement. Coming out of a video, leads feel like they know a destination more intimately than any webpage could describe. If your adventures include a unique cultural or location-based component, videos can draw attention to them and make your descriptions come to life. Ease of Creation: Medium-to-Hard. Depending on the quality of content you want to produce, you’ll probably need more than your iPhone camera. It takes a team to film a professional adventure video, and if you don’t have that team in-staff you’ll need to hire an outside agency. This will lessen the difficulty for you significantly — you’ll just need to be ready to assist with setting shoot days and driving the core message. Utilization: There’s no end to the data that backs up the effectiveness of videos across nearly every channel. Websites using video see a 66% higher conversion rate when compared to websites that don’t host them — so use these on your homepage and whatever adventure pages they can apply to. Visual content is 40 times more likely to be shared on social media — so find ways to divvy the videos up into bite-size pieces and you’ll have enough sharable content to last you for months. Example: Colorado Adventure Center has a great example of video content that they used in conjunction with the opening of their new Sky Trek high ropes adventure course. They were able to introduce the new facility to leads as well as past customers in an exciting way, and the video content can be repurposed for future campaigns. Not all content is created equal. You need to make sure that your content will have an impact on your audience, and know exactly how you can promote it across different platforms. 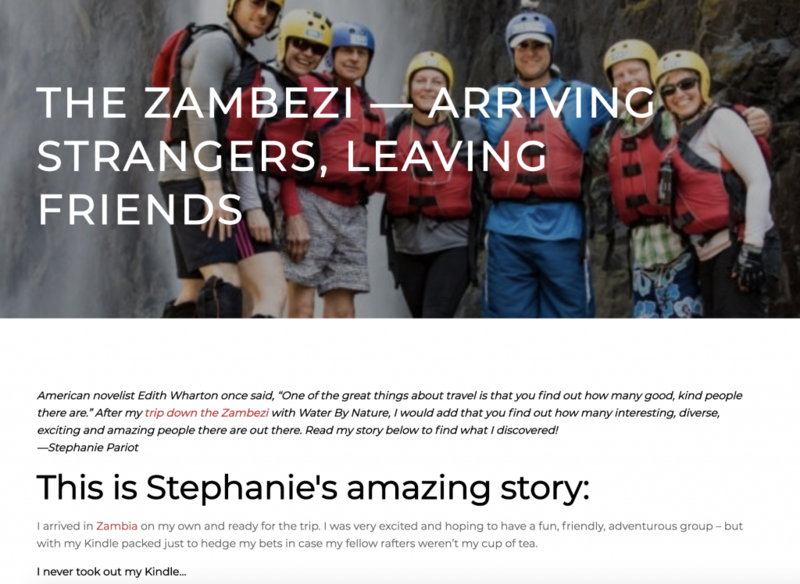 829 Studios has helped adventure travel companies create and promote every type of content mentioned above. We’re ready to help your company generate leads, convert them, and turn them into recurring customers. If you want to feel out this process, let’s chat. We’ll provide more examples of our work and come up with a plan tailored to you.